A rise in home prices tended to lower the birthrate, a trend that existed regardless of whether the economy was good or bad, a report from a local institute said Wednesday. 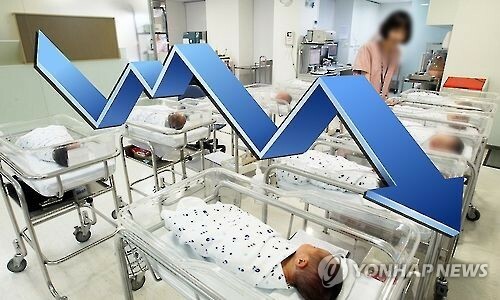 The Korea Institute of Child Care and Education followed the changes in home prices and their correlation to childbirths from 1985-2014 among 19 member states of the Organization for Economic Cooperation and Development. The conclusion was that for every 1 percentage point increase in housing price index, the birthrate fell by 0.072. The housing price index was drawn in comparison to the consumer price index, while the birthrate measurement was per 1,000 people. The report said the trend was the same even when the economy was on upward climb. When the economy was booming, defined by the gross domestic product, childbirth fell by 0.087 per 1 percentage point increase in the home price. At times of economic downturn, the birthrate fell by 0.062. "Through the research, we confirmed that people delaying getting married or having children because of high housing costs is not particular just to South Korea," the report said. Another cited point in the report was that once birthrate starts to fall with economic slump, it does not recover even when the economy improves.